I’ve been growing my hair out and working on an updo here and there, and I thought this one might be easy enough to attempt, especially since our hair protagonist claims that it works with shorter hair. Well, I’m not sure if it’s that my hair is too short, too brown, or that I am somehow lacking in updo talent, but I am seriously not as cute. 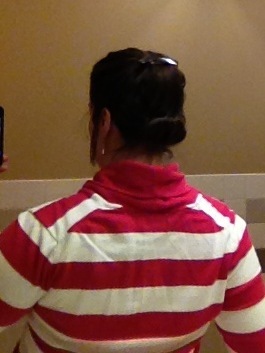 Also, anyone who tells you that horizontal stripes do not make you look fat is either lying or not fat. That’s my story and I’m sticking to it. My recommendation? Don’t try this one until you have more hair than me. And possibly a more flattering sweater. I tried this hair style several times according to this tutorial before finally googling it to look for other tutorials and found one that was much more helpful (this one http://www.youtube.com/watch?v=g5JZOVnSjjE) – it was all about the direction you pulled pony tail holder – you have to pull it upward, not straight out or down. 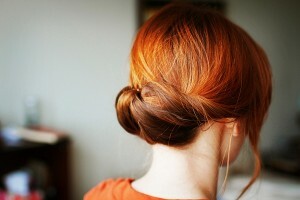 I actually tried this ‘do yesterday. My hair is either too thick or it’s still a bit too short (it’s just a smidge past my shoulders). I really, really, really wanted it to work, but it did not. I had about 8 bobby pins in my hair and I probably could have used more, but they were stabbing my head. My hair just did not want to stay and was slowly coming undone. Fail. 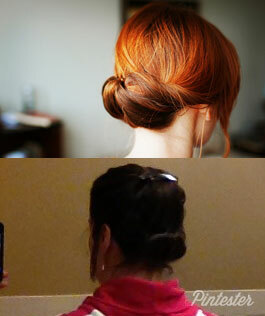 i’ve been trying to do this style for years, but my hair has the ability to propel bobby pins across the room. This one did work for me but would’ve worked better with that lovely shade of red hair.